The challenges of coastal construction have intensified, in correspondence with the number and ferocity of storms in recent years. Stricter building codes, revised flood-zone maps, and a slew of environmental and legislative regulations are making it more difficult, costly, and time-consuming to deliver a quality custom home. At the high end of the market, it’s especially important for clients to understand that cutting costs may be incompatible with creating a true legacy property. Storms can reshape beachfront areas, adding another layer of complexity to a coastal build. The home in Florida’s coastal panhandle, shown at left and below, was built on a site where a hurricane destroyed the existing home and buried remnants of it in the sand. The frontal dune had been washed away. Local architect Geoff Chick had to get a permit from the county to rebuild the dune, then obtain permission from the Florida Department of Environmental Protection (DEP) to build the house. In addition, the DEP required tinted glass and special exterior lighting that won’t disturb nesting sea turtles, and the Florida Fish and Wildlife Conservation Commission had to grant a permit to build in the habitat of the endangered Choctawhatchee beach mouse. Experienced coastal builders take environmental factors into account, whether they’re required to by law or not. 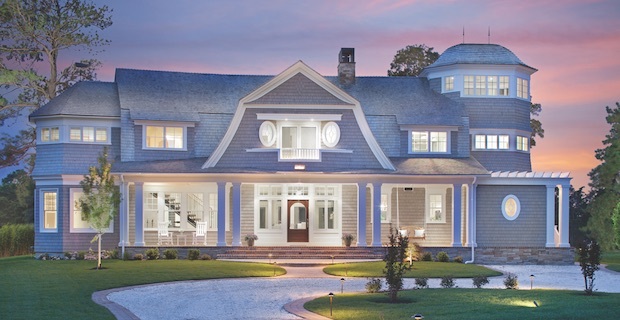 The featured home in Delaware is on a canal 900 yards from the ocean. Burton Builders removed and replaced the soil and constructed a retaining wall landward of the canal that ensures filtration of the watery habitat via wave action. “It was a more environmentally sensitive solution than building a bulkhead,” Burton says. The message here is to start early, get everyone involved, and be transparent with clients about challenges that can drive up the cost of the project. Work with the structural engineer, trade partners, and other team members to give that new home the best possible chance of surviving another Irene, Michael, or Sandy. Geoff Chick’s clients live in Albany, Ga., and wanted a vacation home in Santa Rosa Beach, Fla., where the entire family could gather. The couple purchased a ½-acre lot that had been damaged in a long-ago storm. The 364-foot-deep lot has 67 feet of beachfront on the Gulf of Mexico, but, unlike adjacent lots, it lacked a frontal dune. Rebuilding the dune involved dumping 75 truckloads of sand onto the site, determining setbacks, and resubmitting the design to the county for approval. For the new home, Chick fused the two architectural styles predominant in Santa Rosa Beach: Florida Cracker Cottage and Spanish Mediterranean. He calls the end result “Cracker built on top of Spanish.” The corrugated Galvalume roof and fiber-cement siding are tough materials that stand up well to harsh weather and require little maintenance. The 5,600-square-foot home has a great room with a soaring, vaulted ceiling where the kitchen, dining room, and living room flow together and out to the pool and lanai. An elevator enables aging in place for the clients, who have two adult children. The exterior spaces include private covered decks, an outdoor kitchen and dining area, and a roof deck. 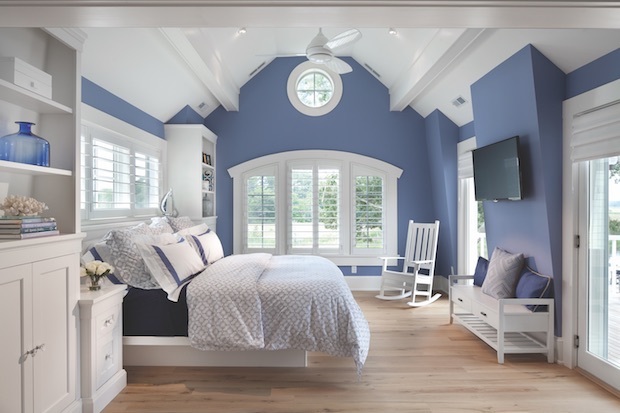 Narrower building masses allow more natural light to reach the interior, and ocean views are maximized from every room. “The tower is a vertical element that breaks up the mass of the house and gives it tremendous curb appeal,” Chick says. Exterior doors are sheltered as much as possible from wind and rain by tucking them into alcoves or behind partial walls. The home is built on an elevated structural-concrete slab, higher than the record 24-foot wave crest established by Hurricane Opal in 1995. The first level of the home has CMU exterior walls, while the upper stories transition to wood-frame construction. The foundation and structural work accounted for a large chunk of the budget, along with code-specified impact glass and hurricane bracing. “You’re required to have a structural engineer design your home to the degree of the wind zone you’re in, which makes the cost of the project grow substantially,” says builder Chris Clark, of Chris Clark Construction, in Santa Rosa Beach. 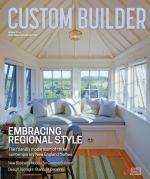 Anthony Wilder Design/Build, in Cabin John, Md., primarily works in the Washington, D.C., metro area. 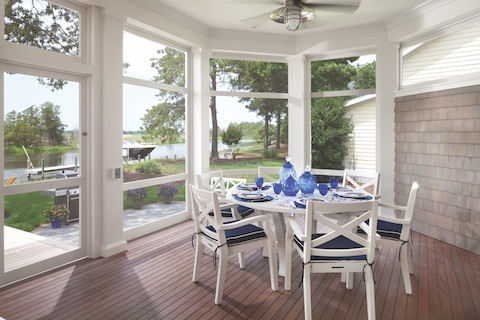 Principal Anthony Wilder designed the featured home in Rehoboth Beach, Del., which is located on the Lewes-Rehoboth Canal (part of the Intracoastal Waterway). 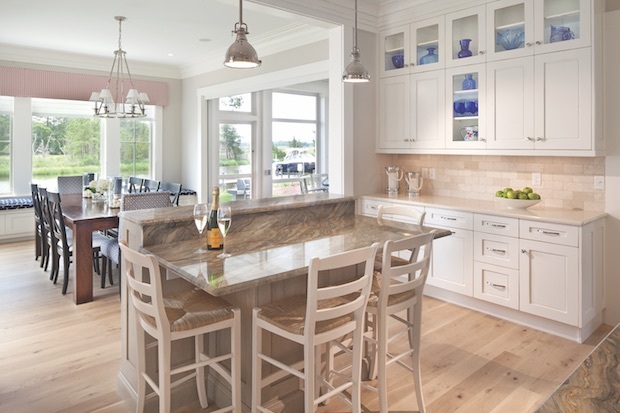 Because of the distance between the builder’s office and the project site, the clients hired out construction to a local Lewes company, Burton Builders. The clients are big fans of New York architect Robert A. M. Stern, known for his Shingle- and Nantucket-style designs, and Anthony Wilder design director, architect Sean Mullin, shares that sentiment. The new home has numerous Stern references, such as the gambrel roof, cedar siding, and various details. The surrounding neighborhood was created after a 1962 nor’easter filled in the land. Burton, who has built many homes in that neighborhood, excavated the existing soil, which rests on top of an old marsh mat, and replaced it with quality soil. Mullin based the design on a 20-foot-deep box “with some appendages coming out of it,” he says. “We squared one of the sides to take advantage of views and the shape of the lot.” Although it’s built on piers, the clients didn’t want the home to be elevated 10 to 15 feet above ground. The architect’s solution: place the first floor 6 inches above flood-elevation requirements, eliminating the need for stilts. 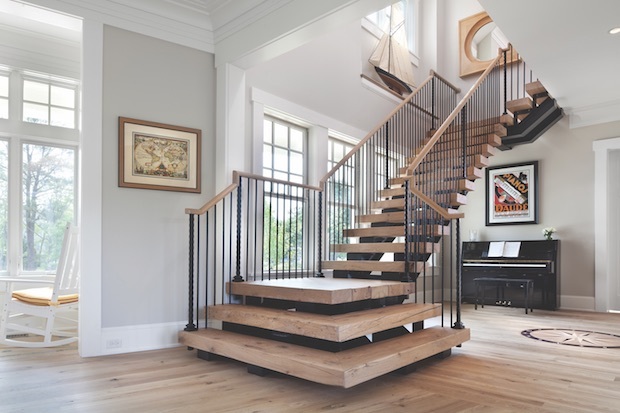 The home has a linear, open floor plan with 10-foot ceilings and a floating staircase that lends itself to the eclectic nature of the interior. It’s designed around a dining room with glass on three sides that faces the canal and opens up to the kitchen. Every room has a water view and access to either a private or public balcony or deck. The left side of the house is angled at 20 degrees to expand views, and there is a clear sight line from the front door to the rear of the house. “Even when you’re up in the [third-floor] turret, which is a home office, you can see the ocean if you stand on your toes, or you’re 6 foot 3, like the client,” he says. Waterproofing is obviously a critical part of building a coastal home, and Burton approached this task as if the house, with its gambrel frame, was the inverted hull of a ship. Ten years ago, he was the first residential builder on the Delaware coast to use Henry Blueskin air- and water-resistant barriers, and he has been using them ever since. Henry Blueskin was originally developed for commercial applications. It costs three times as much as regular housewrap, Burton says, but it’s worth every penny. Real cedar was selected for the roof and siding instead of lower-maintenance synthetic materials. Mullin says it not only looks great but is a finish that Stern preferred to use. The hand-cut, hand-stained cedar shingles are from Longfellow’s Cedar Shingles & Shakes, in Windsor, Maine. Burton Builders used a proprietary stain to give the shingles an aged look. Within a year or two, the shingles will take on the same gray patina as the siding so the entire home looks naturally weathered. The home’s sustainable design elements include geothermal heating and cooling, high-efficiency windows, and a crushed-seashell driveway. “We’re not building houses to last 25 years; we’re building houses to last for a couple of generations,” Burton says. 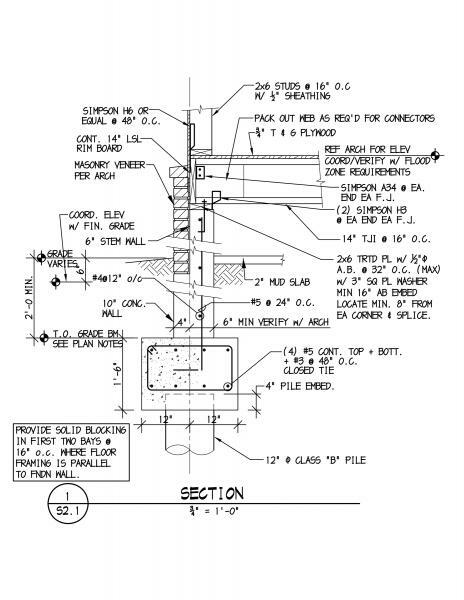 The foundation system (see diagram) was engineered by Baker, Ingram & Associates, a structural engineering firm based in Dover, Del. Burton Builders drove 80 wood pilings into the ground, capped them with concrete grade-beam footings, and then built a block foundation. The home in Santa Rosa Beach, Fla., shown in this article also had to be built on pilings because it’s in a high-velocity flood zone, says local builder Chris Clark of Chris Clark Construction. “The pilings support a massive structural slab filled with steel rebar and hundreds of yards of concrete on top of hundreds of yards of high-quality beach sand,” Clark says. Should the sand be washed out from underneath the home during a storm, the structure will remain standing on the pilings. Comments on: "Coastal Construction: Footprints in the Sand"